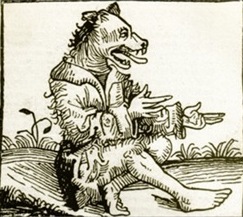 Back in the 1500s and for centuries after, Europe was plagued by the fear of werewolves. Nearly every country reported werewolf sightings, werewolf deaths and so on. But no country has as many werewolf stories as France, which is where today’s tale hales from. The story is that of the Bete de Gevaudon, a creature that terrorized the folks who lived high in the Massif Centrale region in 1764. This was a remote mountainous area with scattered communities living among thick forests and woodlands. In the small village of Lagogne, in the Gevaudon, a vicious wolf-like beast suddenly started attacking and killing people who got too close to the forest edge. The death toll quickly reached 11, which included many well-known local workers, and alarm began to spread quickly throughout the village. Though the deaths were mostly likely caused by a pack of wild wolves, rather than a single creature, the old tales and fears of werewolves took hold of the local’s minds and they believed that the new threat was something supernatural – a werewolf. Eventually broadsheets and pamphlets began circulating, recounting old folktales and gradually spreading the rumor of a werewolf in town. Many of these printings carried monstrous looking woodcuttings and drawings of a terrifying half-man half-wolf creature. This only made the villagers even more afraid, preying on fears and causing regional hysteria. Also in the pamphlets were garbled accounts of werewolf sightings, usually glimpses in the forests of some strange beast. One of the reputed accounts came from a woman who, on her way to Mass, saw a beast man in the form of a wolf with brass buttons around the throat, as if the wolfskin were an overcoat that had been buttoned up over a human form. In another reported case, a woodsman saw a large shaggy shape running along the ground on all fours; he said that it had the shape of a man. In yet another account, a woman, also on her way to Mass, was accosted by a large furry man, who walked alongside her, but who instantly vanished as soon as she screamed the name of Christ. This was a sign, she declared, that the creature had either been the Devil or one of his agents. She was sure that it was a werewolf she saw. Shortly after, the killings stopped and the Bete de Gevaudon was never caught. Chances are that all of the werewolf sightings were caused by the overactive imaginations of villagers scared by the horrible stories they were hearing and reading. But who knows, maybe one of them really did see a werewolf. Although, giving the superstitious times, I doubt it.